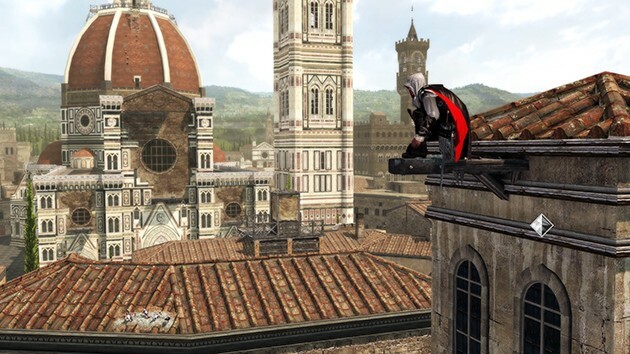 When you hear the name Ezio Auditore da Firenze, you immediately associate it with rooftop jumping, building scaling, swash-buckling action in a setting crammed with rich culture, history and intriguing characters with fascinating back stories. To have that packaged into a game leaves you foaming at the mouth as you venture through ancient Italy, witnessing the birth of said protagonist and learning about his journey, cultivating immense skill through the years, evolving into a well feared assassin. You’d expect such an epic amalgamation to receive a remaster fit for a king. Unfortunately, such is not the case for the legendary assassin and his tale. Ezio. The Assassin. The Legend. Nothing is more satisfying than a congruent story spanning across three installments, each one answering (some) questions, revealing new secrets, adding more dimensions to an already daedal and intriguing character. 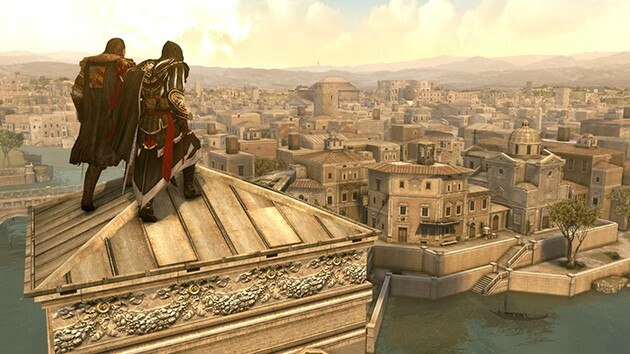 In its entirety, and arguably, the Ezio story is the most well crafted of the series. Set in 15th century Italy, you’re out to discover the secrets of your lineage while avenging the undue execution of your father an brothers. You travel from ancient cities and Tuscan countrysides rebuilding family name and honour, while establishing legendary status in your quest to unravel and deconstruct the Templars. Out of the three, Assassin’s Creed II gets the gold medal for all-round story telling with Brotherhood a close second. Revelations somehow misses that addictive story ability, but makes up for it with rich visuals and more involved game play scenarios. Oh, you want to jump across to that building stylishly? OK, here. Fall to your doom like an insane asylum escapee. I liked the Assassin’s Creed series when it first launched and saw it as a franchise that set a new standard for games of it’s genre to come. The trailers depicted a huge world with effortless sprawling across city skylines, surprising foes with grace and skill. If you have played any of the games in the series before Unity and Black Flag, you’d know that that was not what you were getting yourself into. The control mechanics needed more than just mastering, it needed you to have 12 fingers and the ability to see the future so you can do that 1 millisecond adjustment before you careen into a crowd of people (if you’re lucky) or emphatically crash onto cobblestone streets. 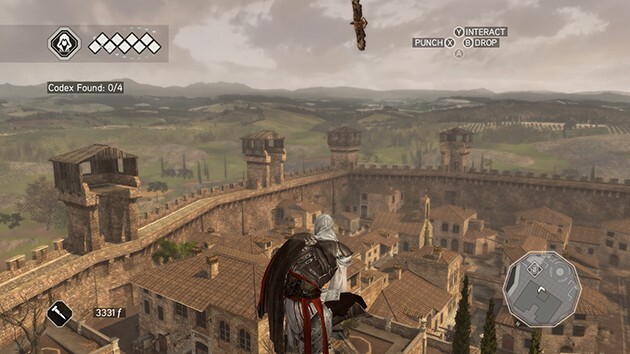 Not much, or dare I say, NOTHING was done to improve the control you have over Ezio. Every leap, run, jump and climb becomes a chore. 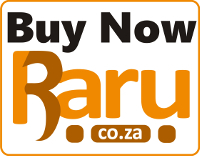 You’ll end up looking for any alternative means of transport you can find to avoid running across a myriad of buildings and obstacles as to reach your destination without any broken limbs. Warning: Avoid throwing your controller at the screen, rather just go do parkour outside in real life, it’s less painful. Well, maybe for some. Grefix Update? What Grefix update? Maybe we’ve been spoiled with other remastered titles taking the initiative and redeveloping the entire game from the ground up with revised mechanics, the latest engine architecture to deliver a ultimate edition of the well known offering. Ubisoft somehow didn’t read or research the above quote and rather opted to bring us highly saturated colours, shinier leather bits and polished metals and made shadows almost non-existent with peculiar shading effects that makes everything appear cartoonishly flat. There are more detailed textures, but they get lost in the over-saturated guise. The only “big” improvement is the greater draw distances for background visuals. Eagle post synchronisation is actually pleasing, fulfilling even after fighting with the gameplay mechanics to get to the perch. 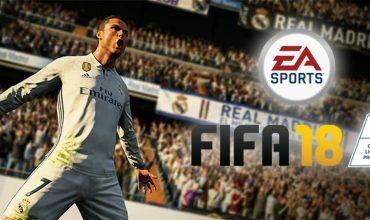 Some issues from the previous renditions actually crept it’s way into the remaster, indicating that the vast overall improvement and bug fixing was not part of the brief. The infamous background NPC that looked like cardboard actors cladded in bad make up unfortunately only seem to have gotten beat with an even uglier stick. The main character got a bit of a makeover, but for some (Lucy) you’ll notice their eyes doing some weird stuff during close up dialogue. 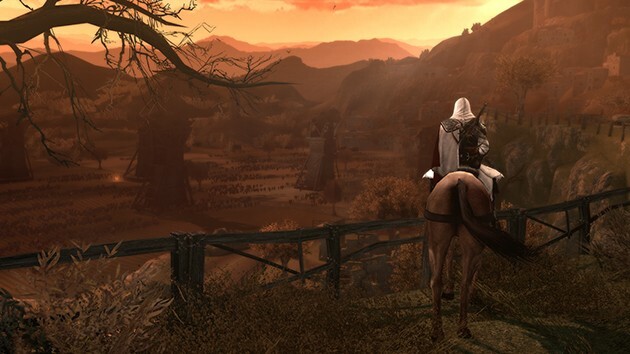 Most of the disappointments occur in Assassin’s Creed II, with little improvements in Brotherhood, and Revelations being the prettiest of the bunch with all three titles running 1080p, but not without frame rate issues for the first two. The camera still does a weird ‘freak out’ when dangling from rooftops or scampering up walls, which nudges you to the edge of motion sickness. 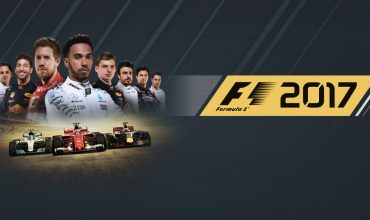 As a remaster of a once (probably still) a great series, it doesn’t seem to be worthy of the title “remastered” as a lot is left to be desired in terms of gameplay mechanics, lack of historic bug fixes and underwhelming graphic improvement. 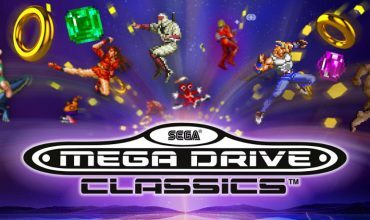 The story, however, is the only unchanged (thankfully) component that would entice you to replay the game if you are OK dealing with the inability to gain full control of the character and flat, colourful visuals. Ubi, you got some explaining to do. 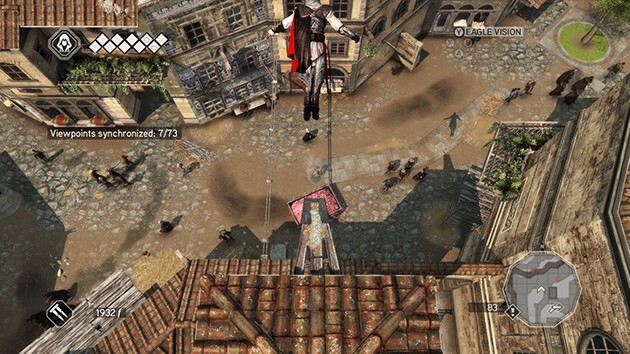 Ezio's remastered leap misses the rooftop.